Many people spend all their life searching for their identities trying to understand who they are and what their purpose in life is. I thought I was luckier than many of those people when a few years ago I finally realized my mission in life and I identified myself as a global citizen who is determined to defend human rights and build peace. I never questioned my purpose or identity and every day I had more hope than before. I felt that serving others is the greatest cause that anyone can live for. I have always been inspired by heroic stories and great leaders such as Anwar Al-Sadat, Gandhi, Malcolm X, Nelson Mandela, etc. They have challenged the chaotic world with their views and they paid their life to defend principles and values. I did realize that the way to change is full of obstacles and that great people walked a long road to freedom. Therefore, despite the violations of human rights during Mubarak’s regime, I still had hope that things will gradually change to a better future especially that awareness on human rights spread bit by bit. I thought my dream came true when Egyptians finally united against the tyrant President in an unprecedented movement to revolt against dictatorship. 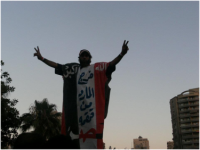 The revolt in Egypt was more than just a movement for political freedom. The lack of basic human rights and dignity triggered for this uprising. Poverty became pervasive across all aspects of life and encompasses a range of issues, including health, housing, education, nutrition and life expectancy. Egypt’s terrible infrastructure, horrible state of the roads, infrastructural failings and the endless traffic jams have gone from worse to worst in recent years. Garbage piling up in the streets of the city and the broken sidewalks covered with dust and trash became unbearable. Protestors also demonstrated against the massive income gaps where the rich lived in newly designed verdant cities, while the poor lived in slums under extreme and inhumane conditions. Corruption, oppression and torture played a part in bringing discontented Egyptians out on the streets. Thousands sacrificed their lives asking for “Bread, freedom and social justice”. Fearless of death, people stood up to the brutality of the security forces and hired thugs who attacked protestors with weapons, cars, Molotov cocktails and snipers. 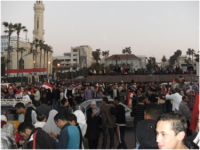 In February 11th 2011, mass celebrations of Mubarak’s departure expressed the spirit of unity, camaraderie, solidarity, harmony, warmth, and above all, optimism. For the first time, Egyptians felt that they are free and have a will. Dreaming that democracy and sustainable development will follow, we thought the dark days were over and that we have witnessed an unprecedented historical movement that overthrew one of the worst dictators in history. Dreams of social justice, better standard of living, access to public services, and prosperity were shared by all people. However, optimism was soon replaced by the fear of the Muslim Brotherhood (the most organized opposition group) and Islamists coming to power. The situation became more complex because the unity was broken into different identities; Muslim Brotherhood, Salafists, Jihadiis, liberals, socialists, old regime supporters, etc. Dissention, mutual accusations, distrust and suspect revealed by all media channels were not very promising signs and were early warning that the elections will also serve to further divide Egyptians and possibly create future internal conflict. While most people found their identity with the Revolution - and they quickly labeled themselves as Muslim Brotherhood, Salafists (Islamists) or liberals - , many people like myself, have lost their identity and have lost every sense of who they are and what they believe in. It is mainly because the media have already made up identities for people and being unable to fit into one of the existing labels might put one in the position of suspicion. There is no middle ground and one does not dare to defend the other rival party claiming to be objective or analytical because the rule is ‘if you are not with us, you are against us’. I recall a few incidents when I was harshly criticized and ridiculed because I tried to defend the right of Muslim Brotherhood to freedom of thought and conscience, although I stressed that I am against Islamist political ideologies but I only denounced hatred speech and dehumanizing others. Regrettably, defending the ‘enemy’ backfired on me and I was humiliated every time I met with anti-Islamists. Even when I stayed quiet, I was blamed for not joining the public attack on Islamists. The same happens when I meet supporters of Islamists as I am criticized for not being on the side of Islamists and even accused of having lost my faith. The hatred between the two sides grew gradually and the situation developed to the extent that the mention of Muslim Brotherhood has become taboo in certain places, and supporters of Muslim Brotherhood have to keep their identities secret in public. Disunity and rivalries replaced the spirit of unity and solidarity to mark the post-revolutionary phase and politicians rivaled to grab political power. The media played a major role in breaking people’s unity and fueling the conflict gearing up for a future civil war. The liberal party and their supporters conducted a vicious propaganda campaign against the political force that ‘threatens’ their identity, in which they blamed Islamists for Egypt’s ills and backwardness. The propaganda campaign against the Muslim Brotherhood resembles the Nazis’ propaganda assault that started a few years before the Holocaust. The Nazis’ propaganda started with theological anti-Judaism which resulted in the desire to eliminate the Jews from within Christian lands. It all started with the wide spread of the weekly Nazi newspaper Der Stürmer (The Attacker), which proclaimed, « The Jews are our misfortune! ", and regularly featured cartoons of Jews as apelike and hooked-nosed. For two years, right after the Revolution, all the media channels were deployed to divert anger and hatred towards Islamists by dehumanizing and caricaturing Islamists. On the other side, Islamists have deployed all their media channels to fire back at the liberals and blamed them for the disability and insecurity of Egypt in return. Liberals accused Islamists to be undemocratic and some have gone far to describe Morsi as the new Pharaoh. While this may be true, this also applies to everyone else. Dictatorship has been a facet of our society. People were born into dictatorship and the history of Pharos has become interwoven in the fabric of our culture. People are not only used to dictatorship as a system that rules their lives, but everyone practices forms of dictatorship in their own circle of influence. Whereas to be a liberal is taken to be democratic, Egyptian politicians claiming liberalism have been making obvious betrayals of democratic principles. Instead of campaigning and preparing for future elections, liberals have sought all means to plot and turn people against Islamists because despite everything, Islamists overwhelmingly won the majority of seats in the parliament. In order to illegally end the term of their democratically elected Islamist president almost before his term started, the once divided opposition quickly formed a new bloc – the National Salvation Front (NSF). Since the NSF lined up against Morsi, Egypt has been rocked by a wave of violence. The bloc’s main concern is to fiercely criticize the ruling Islamist party and they offer no alternative options except protests. As protests escalated and violence flared, the majority of people have become depressed that the opposition has simply become ‘Anti-Morsi’ and nothing further. Running short of plans for a new and thriving Egypt, liberals occupied themselves with conspiracies to exclude the strongest political force in the country and to spread the culture of hatred and violence by rallying protestors and thugs to attack Muslim Brotherhood offices and headquarters. The uprising against the tyrant Mubarak, who ruled the country for three decades, has been termed a « white » revolution because it was a peaceful movement and the only blood spilt was at the hands of the regime and its cohorts. On the contrary, the movement against Morsi, the first elected President, who has been in power for one year only, has been featured with Molotov Cocktails, knives, stones, and white weapons. In several governorates across Egypt, thugs – backed by National Salvation Front supporters – attacked and burnt the Freedom and Justice Party headquarters. Feeling discriminated and oppressed, supporters of Islamists engage in bloody interactions with the anti-Morsi protestors and their thugs. Fighting over identities dragged Egypt into the dark tunnels of savagery and violence. Egypt bitterly divided between Islamists and liberals from one side and the rise of the black bloc, the ultras and thugs from the other side are bringing Egypt to the brink of a civil war. Egypt has witnessed massacres in the last few months and protests – that once have been called peaceful – have been associated with bloodbath. All the groups are fighting each other in the name of one cause ‘democracy’ unaware that democracy cannot be the outcome of blood and violence. In the history of all the Revolutions, it is common knowledge that governments do not transform overnight. Regimes are not confined to one man especially that corruption was deeply rooted in all formal and informal institutions, corporations, associations, networks, public servants, partisans, technocrats, teachers, individuals, etc. It has been a feature of the society in the recent years. Thus, the work of transforming Egypt to a democracy will likely be a difficult and frustrating process that could take a generation or more. Whereas the liberals and Islamists are occupied in a political war, the frustrated population is fed up with electoral reform and parliamentary democracy. The economic condition has gone from worse to worst and the Egyptian pound is slipping against the dollar. Poverty is increasing and daily injustices are not addressed. People expected the revolution to bring them dignity, adequate healthcare, decent shelter, decent education, better wages and standard of living. Instead, the revolution has brought violence, turmoil, conflict, insecurity and political vacuum. It has broken the unity of groups, families and friends by new identities.